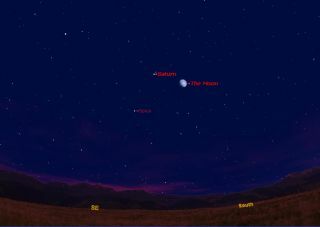 This sky map shows how Saturn, the moon and the bright star Spica will appear on May 14, 2011 as seen from mid-northern latitudes at about 9 p.m. local time. If you've been watching the night sky these past few weeks and gazed almost due south and about halfway up in the sky, you likely noticed two bright "stars" even from brightly lit cities. The brighter of the two is not really a star at all, but a planet: Saturn. Glowing sedately with a steady yellow-white hue, Saturn is visible in the night sky right on into the wee hours of the morning before it sets. This weekend, the ringed planet will appear in a triangle pattern with the moon and a bright star. Situated below and to Saturn's left is the bluish star Spica, in the constellation Virgo, the 16th brightest star in the sky, which is located 260 light-years from Earth. Spica is about eight times larger than our sun and nearly 2,300 times brighter. During a three-night span of Friday, Saturday and Sunday, a third celestial object will join in the scene: the moon. The sky map of Saturn, the moon and Spica here shows their appearance Saturday night. On Friday night (May 13), the moon, Saturn and Spica will form a broad triangle. The moon will be a waxing gibbous spectacle, roughly midway between its "half" or first quarter phase (which occured May 10) and full phase (May 17). Saturn will appear well above and to the left of the moon, while Spica will be positioned far to the left of both. On Saturday evening (May 14), the scene will have changed radically. Now, the moon has moved down to sit just off to the right of Spica. Saturn will stand well above and a bit to the right of both. The configuration now resembles a long, narrow isosceles triangle, with the "legs" of the triangle measuring about 14 degrees across. For comparison, your clenched fist held at arm’s length measures roughly 10 degrees, so on Saturday Saturn will lie roughly 1 1/2 "fists" from both the moon and Spica. Finally on Sunday evening (May 15), we no longer are dealing with triangles, but rather a long line. The moon at first glance resembles a "full" moon (though full phase is still two nights away) and will lie about 13 degrees below and to Spica's left. And Saturn will still be hovering about 14 degrees to the upper right of Spica. The whole moon-star-planet array will now stretch across nearly 30 degrees, or about three "fists." Just 21 months ago, Saturn’s rings were all but invisible to us because they were turned edge-on (or nearly so) toward Earth. Now, however, they are tilted 7 1/2 degrees toward us, and are readily seen if you are using a magnification of at least 30-power.